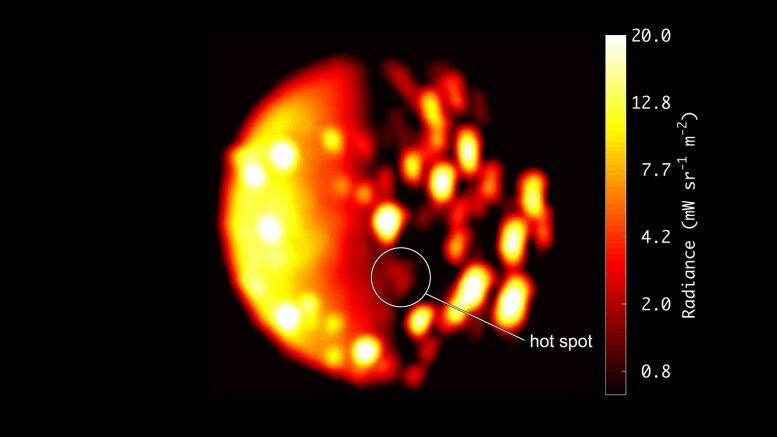 Data collected by NASA’s Juno spacecraft using its Jovian InfraRed Auroral Mapper (JIRAM) instrument point to a new heat source close to the south pole of Io that could indicate a previously undiscovered volcano on the small moon of Jupiter. JPL manages the Juno mission for the principal investigator, Scott Bolton, of Southwest Research Institute in San Antonio. The Juno mission is part of the New Frontiers Program managed by NASA’s Marshall Space Flight Center in Huntsville, Alabama, for the Science Mission Directorate. The Italian Space Agency (ASI), contributed two instruments, a Ka-band frequency translator (KaT) and the Jovian Infrared Auroral Mapper (JIRAM). Lockheed Martin Space, Denver, built the spacecraft. JPL is a division of Caltech in Pasadena, California..